Мi Khan National Technical University of Ukraine "Igor Sikorsky Kiev Polytechnic Institute"
The review is given of scientific works made in the past decade concerning development, research of properties, operational parameters, directions of practical use of magnetic susceptible nanomaterials and nanocomposites promising for creation of new forms of complex medicinal preparations with cytotoxic, immunotherapeutic and hyperthermal action, immunomagnetic sorbents, means for decontamination viruses from plasma and serum of human donor blood and the like. Their analysis testifies to the relevance of the outlined topics and the promising application in various fields of medicine, biology, and biotechnology. 1. Shpak A.P., Gorbik P.P. Fiziko-khimiya nanomaterialov i supramolekulyarnykh struktur. V. 1. (Kyiv: Naukova dumka, 2007). [in Russian]. 2. Patent UA 86322. Gorbik P.P., Petranovska A.L., Usov D.G., Storozhuk L.P. Nanokapsula z funktsiyamy nanorobota. 2009. [in Ukrainian]. 3. Shpak A.P., Gorbyk P.P. Nanomaterials and Supramolecular Structures: Physics Chemistry and Applications. (Springer, 2009). 4. Gorbik P.P., Turov V.V. Nanomaterialy i nanokompozity v meditsine, biologii, ekologii. (Kyiv: Naukova dumka, 2011). [in Russian]. 5. Gorbik P.P., Gorobets S.V., Turelik M.P. Biofunktsionalizatsiya nanomaterialiv i nanokompozytiv. Navchal'nyy posibnyk. (Kyiv: Naukova dumka, 2011). [in Ukrainian]. 6. Patent UA 99211. Gorbik P.P., Korduban A., Shpak A.P., Vasilieva A.A., Turanska S., Lukyanova N., Petanovskaya A., Chekhun V.F., Turelyk M.P. Nanokapsula z funktsiyamy nanorobota. 2012. [in Ukrainian]. 7. Turelik M.P. Ph.D. (Chem.) Thesis. (Kyiv, 2012). [in Ukrainian]. 8. Gorbik P.P. Nanokompozyty z funktsiyamy medyko-biolohichnykh nanorobotiv: syntez, vlastyvosti, zastosuvannya. Nanosistemi, Nanomateriali, Nanotehnologii. 2013. 11(2): 323. [in Ukrainian]. 9. Uvarova I.V., Gorbik P.P., Gorobets S.V., Ivaschenko O.A., Ulyanchenko N.V. Nanomaterialy medychnoho pryznachennya. (Kyiv: Naukova dumka, 2014). [in Ukrainian]. 10. Gorbyk P.P., Lerman L.B., Petranovska A.L., Turanska S.P. Advances in Semiconductor Research: Physics of Nanosystems, Spintronics and Technological Applications.Magnetosensitive Nanocomposites with Functions of Medico-Biological Nanorobots: Synthesis and Properties. Chapter 9. (New York: Nova Science Publishers, 2014). 11. Gorbyk P.P., Lerman L.B., Petranovska A.L., Turanska S.P., Pylypchuk le.V. Magnetosensitive nanocomposites with hierarchical nanoarchitecture as biomedical nanorobots: Synthesis, properties, and application. Chapter 10. Fabrication and Self-Assembly of Nanobiomaterials. Applications of Nanobiomaterials. 2016. 1: 289. 12. Patent UA 112490. Chekhun V.F., Lukyanova N.Yu., Gorbik P.P., Todor I.M., Petranovskaya A.L., Boshitskaya N.V., Bozhko I.V. Protypukhlynnyy feromahnitnyy nanokompozyt. 2016. [in Ukrainian]. 17. Turanska S.P., Kusyak A.P., Turov V.V., Gorbyk P.P. Interaction of magnetic nanoparticles with cells. Surface. 2013. 5(20) 227. [in Ukrainian]. 18. Vol'ter E.R. Ph.D. (Biolog.) Thesis. (Sukhumi, 2005). [in Russian]. 26. Houdy P., Lahmani M., Marano F. Nanoethics and Nanotoxicology. 1st Edition. (Paris: Éditions Bélin, 2010). 33. Vazhnichaya Ye.M., Devyatkina T.A., Moklyak Ye.V. Pharmacological properties of magnetite nano-particles. Visnyk Ukrayins'koyi Medychnoyi Stomatolohichnoyi Akademiyi "Aktual'ni Problemy Suchasnoyi Medytsyny". 2016. 16(1(53)): 291. [in Ukrainian]. 37. Roohi F., Lohrke J., Ide A. Studying the effect of particle size and coating type on the blood kinetics of superparamagnetic iron oxide nanoparticles. Int. J. Nanomedicine. 2012. 7: 4447. 46. Kalinichenko E.A. Effect of form and dimensions of magnetite nanoparticles on relaxation time of the magnetic moment. Mineralogical Journal. 2011. 33(2): 42. [in Russian]. 52. Liu Y.X., Chen Z.P., Wang J.K. Internalization of DMSA-coated Fe3O4 magnetic nanoparticles into mouse macrophage cells. Adv. Mater. Res. 2012. 455–456: 1221. 57. Pushkar' V.G., Efremenko V.I., Klimov I.M., Gavenskiĭ S.D., Trofimov E.N. Preparation and use of magnetic sorbents for studying microorganism antigens. Zh. Mikrobiol. Epidemiol. Immunobiol. 1985. 12: 30. 62. Van Oss C.J. Interfacial Forces in Aqueous Media. (New York: Marcel Dekker, 1994). 68. Kruszewski M., Iwaneńko T. Labile iron pool correlates with iron content in the nucleus and the formation of oxidative DNA damage in mouse lymphoma L5178Y cell lines. Acta Biochim. Pol. 2003. 50(1): 211. 69. Gorbik P.P. Nanokompozyty z funktsiyamy medyko-biolohichnykh nanorobotiv: syntez, vlastyvosti, zastosuvannya. Nanosystems, Nanomaterials, Nanotechnologies. 2013. 11(2): 323. [in Ukrainian]. 70. Shpak AP, Gorbik P.P. Fiziko-khimiya nanomaterialov i supramolekulyarnykh struktur. V. 1. (Kyiv: Naukova dumka, 2007). [in Russian]. 71. Luria S., Darnell J., Baltimore D., Cempbell E. Obshchaya virusologiya. (Moscow: Mir, 1981). [in Russian]. 72. Chuiko O.O. Meditsinskaya khimiya i klinicheskoye primeneniye dioksida kremniya. (Kyiv: Naukova dumka, 2003). [in Russian]. 73. Skoups R. Metody ochistki belkov. (Moscow: Mir, 1985). [in Russian]. 74. Semko L.S., Storozhuk L.P., Gorbik P.P. Mahnitni nanokompozyty Fe3O4/SiO2 ta imunosorbenty na yikh osnovi. Chemistry, Physics and Surface Technology. 2009. 15: 311. [in Ukrainian]. 75. Vergun L.Yu., Klimchuk D.A., Gorbik P.P. Sintez immunomagnitnykh sorbentov dlya separatsii virusov gepatitov V i S. Mykrobyolohycheskyy Zhurnal. 2009. 71: 65. [in Russian]. 77. Dao V.Q., Nguyen M.H., Pham T.T., Nguyen H.N. Synthesis of silica-coated magnetic nanoparticles and application in the detection of pathogenic viruses. J. Nanomater. 2013. 2013: Article ID 603940. 91. Kumar S.R., Paulpandi M., ManivelRaja M., Mangalaraj D., Viswanathan C., Kannanb S., Ponpandian N. An in vitro analysis of H1N1 viral inhibition using polymer coated superparamagnetic Fe3O4 nanoparticles. RSC Adv. 2014. 26: 21506. 95. Petranovska A.L., Mishchenko V.N., Turelyk M.P., Gun'a G.M., Gorbyk P.P. The features of immunoglobulin immobilization processes on the surface of magnetite/hydroxyapatite magnetosensitive nanocomposite. Him. Fiz. Tehnol. Poverhni. 2010. 1(2): 182. [in Ukrainian]. 96. Uvarova I.V., Gorbik P.P., Gorobets S.V. Nanomaterialy medychnoho pryznachennya. (Kyiv: Naukova dumka, 2014). [in Ukrainian]. 98. Sarnatskaya V.V. Interaction of magnetite Fe3O4 nanoparticles functionalized with oleic acid and polyethylene glycol with albumin. Reports of the National Academy of Sciences of Ukraine. 2013. 9: 164. [in Russian]. 100. Huang J., Liu C., Xiao H., Wang J., JiangD., Gu E. Zinc tetraaminophthalocyanine-Fe3O4 nanoparticle composite for laccase immobilization. Int. J. Nanomedicine. 2007. 2(4): 775. 104. 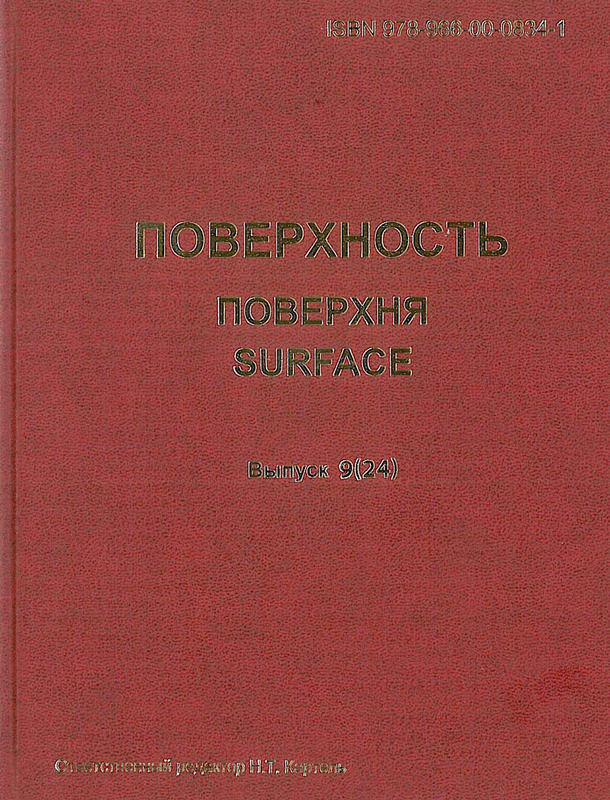 Semko L.S., Hutornyy S.V., Storozhuk L.P., Dzyubenko L.S., Abramov N.V., Gorbyk P.P. Chemical engineering and research the properties of magnetically operated adsorbents for the extraction of nucleic acids. Surface. 2010. 2(17): 330. [in Ukrainian]. 109. Palyvoda O.M., Chernishov V.I., Chekhun V.F., Todor I.N., Kuzmenko O.I. Colloidally stable surface-modified iron oxide nanoparticles: preparation, characterization and anti-tumor activity. J. Magn. Magn. Mater. 2015. 380(15): 125. 120. Shpak A.P., Gorbyk P.P. Nanomaterials and Supramolecular Structures. Physics Chemistry, and Applications. (Springer Nederlands, 2009). 121. Gorbik P.P., Chekhun V.F., Shpak A.P. Nanostrukturnyye materialy – polucheniye, svoystva, primeneniye. (Minsk: Bielaruskaja navuka, 2009). [in Russian]. 122. Patent UA 86322. Gorbik P.P., Petranovska A.L., Usov D.G., Storozhuk L.P. Nanokapsula z funktsiyamy nanorobota. 2009. [in Ukrainian]. 123. Gorbik P.P., Turov V.V. Nanomaterialy i nanokompozity v meditsine, biologii, ekologii. (Kyiv: Naukova dumka, 2011). [in Russian]. 124. Gorbik P.P., Gorobets S.V., Turelyk M.P., Chekhun V.F., Shpak A.P. Biofunktsionalizatsiya nanomaterialiv i nanokompozytiv. Navchal'nyy posibnyk. (Kyiv: Naukova dumka, 2011). [in Ukrainian]. 125. Patent UA 99211. Gorbik P.P., Korduban A., Shpak A.P., Vasilieva A.A., Turanska S., Lukyanova N., Petanovskaya A., Chekhun V.F., Turelyk M.P. Nanokapsula z funktsiyamy nanorobota. 2012. [in Ukrainian]. 126. Gorbik P.P., Abramov M.V., Petranovskaya A.L., Turelyk M.P., Vasilieva O.A. Svidotstvo pro reyestratsiyu avtors'koho prava 46056. State Intellectual Property Service of Ukraine. 2012. [in Ukrainian]. 127. Patent UA 78473. Abramov N.V., Gorbyk P.P., Petranovskaya A.L., Vasilieva A.A., Turelyk M.P., Chekhun V.F., Paton B.E., Lukyanova N.Yu. Mahnitna protypukhlynna ridyna. 2013. [in Ukrainian]. 128. Patent UA 78448. Gorbik P.P., Abramov N.V., Pylypchuk Ye.V., Petranovskaya A.L., Vasilieva A.A., Turelyk M.P. Mahnitna ridyna. 2013. [in Ukrainian]. 129. Gorbik P.P., Turelyk M.P., Gorobets S.V., Gorobets O.Yu., Demyanenko I.V. Biofunktsionalizovani nanomaterialy i nanokompozyty: naukovi osnovy ta napryamy zastosuvannya. Navchal'nyy posibnyk. (Kyiv: NTTU (KPI), 2013). [in Ukrainian]. 130. Tereshchenko V.P., Kartel M.T. Mediko-biologicheskiye effekty nanochastits: realii i prognozy. (Kyiv: Naukova dumka, 2010). [in Russian]. 131. Chekman I.S. Nanofarmakolohiya. (Kyiv: Zadruha, 2011). [in Ukrainian]. 132. Turanska S.P., Kaminsky A.N., Kusjak N.V., Turov V.V., Gorbyk P.P. Synthesis, properties and application of magnetodirected adsorbents. Surface. 2012. 4(19): 266. [in Russian]. 135. Bozhenko O.M., Omel'chuk Yu.A., Gomelya M.D. Otrymannya vysoko selektyvnykh sorbentiv dlya vyluchennya midi z vod system okholodzhennya AES. Zbirnyk naukovykh prats' Sevastopol's'koho natsional'noho universytetu yadernoyi enerhiyi ta promyslovosti. 2009. 148. [in Ukrainian]. 138. Usov D.G., Petranovskaya A.L., Turelyk M.P., Korduban O.M., Gorbik P.P. Syntez ta fizyko-khimichni vlastyvosti nanokompozytiv na osnovi mahnetytu, modyfikovanoho mezo-2-3-dymerkaptosuktsynovoyu kyslotoyu. Chemistry, Physics and Surface Technology. 2009. 15: 320. [in Ukrainian]. 141. Liang B. Adsorption characteristics of Hg2+ ions using Fe3O4/chitosan magnetic nanoparticles. Adv. Mater. Res. 2011. 291–294: 72. 146. Mishchenko V.N., Kartel M.T., Lucenko V.A., Nikolaychuk A.D., Kusyak N.V., Korduban O.M., Gorbyk P.P. Magnetosensitive adsorbents based on activated carbon: synthesis and properties. Surface. 2010. 2(17): 276. [in Ukrainian]. 159. Gorbik P.P., Abramov M.V., Petranovskaya A.L., Turelyk M.P., Vasilieva O.A. Svidotstvo pro reyestratsiyu avtors'koho prava 46056. State Intellectual Property Service of Ukraine. 2012. [in Ukrainian]. 160. Semko L.S., Gorbik P.P., Storozhuk L.P., Dzyubenko L.S., Dubrovin I.V., Oranskaya O.I. Modyfikuvannya mahnetytu dyoksydom kremniyu. Physics and Chemistry of Solid State. 2007. 8(3): 526. [in Ukrainian]. 161. Semko L.S., Gorbik P.P., Chuyko O.O., Storozhuk L.P., Dubrovin I.V., Oranska O.I., Revo S.L. Modyfikuvannya mahnetytu dioksydom tytanu ta vlastyvosti oderzhannya nanokompozytiv. Reports of the National Academy of Sciences of Ukraine. 2007. 2: 150. [in Ukrainian]. 162. Petranovskaya A.L., Usov D.G., Abramov M.V., Demchenko Yu.O., Korduban O.M. Modifitsirovaniye poverkhnosti nanokristallicheskogo magnetita izopropilatom alyuminiya. Chemistry, Physics and Surface Technology. 2007. 13: 310. [in Russian]. 163. Gorbik P.P., Mishchenko V.N., Petranovska A.L., Demchenko Yu.O., Korduban O.M., Karbovskiy V.L., Shpak A.P. Syntez nanokompozytiv mahnetyt/hidroksoapatyt ta doslidzhennya yikh vlastyvostey. Nanosistemi, Nanomateriali, Nanotehnologii. 2008. 6(4): 1273. [in Ukrainian]. 165. Chuiko A.A., Gorlov Yu.I., Lobanov V.V. Stroyeniye i khimiya poverkhnosti kremnezema. (Kyiv: Naukova dumka, 2007). [in Russian]. 166. Semko L.S., Hutornyy S.V., Abramov N.V., Gorbyk P.P., Dzyubenko L.S., Oranska O.I. Magnetic fluids and nanocomposites based on Fe3O4. Surface. 2011. 3(18): 265. [in Russian]. 167. Kuzmenko M.Yu., Kuzmenko S.M., Scrinnik O.V. Synthesis and properties [(butoxy)titanium]borates. Voprosy Khimii i Khimicheskoi Tekhnologii. 2014. 1: 53. [in Russian]. 169. Mironyuk I.F., Gumenyak V.V., Mandzyuk V.I., Bezruka N.A. Budova ta morfolohiya chastynok Al2O3, oderzhanykh za riznykh umov hazofaznoho syntezu. Physics and Chemistry of Solid State. 2013. 13(3(201)): 715. [in Ukrainian]. 170. Nakamoto K. IK-spektry i spektry neorganicheskikh i koordinatsionnykh soyedineniy. (Moscow: Mir, 1991). [in Russian].